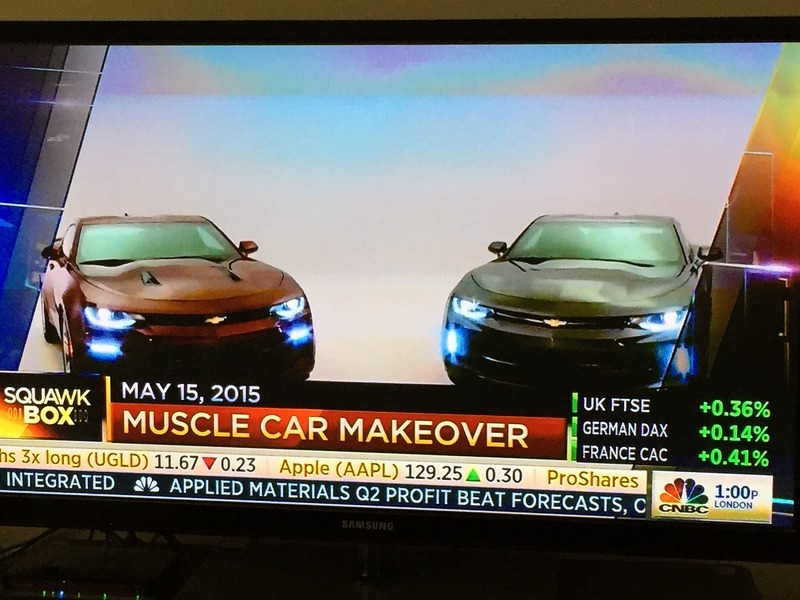 CNBC broadcast the first test ride in a 2016 Camaro this morning. And while this was a pre-production V-6 manual prototype, and still in camouflage, we do get to hear the car rev and rev. And it sounds great! And of course this brings to mind the infamous Camaro vs. Mustang rivalry (and we’ll have much more to say on this topic once the specs are released by GM). With the Camaro downsized to roughly the same size as the Mustang, and with the weight now equalized, the competition will finally be on more level ground. But while the Camaro and Mustang both use a strut-type front suspension and independent rears, the similarity stops there. The Camaro uses the highly advanced and weight-optimized Alpha platform while the Mustang uses an evolution of its prior chassis (which itself was dumbed down from the state-of-the-art DEW98 platform). The Alpha platform is shared with the CTS and ATS, which makes available all sorts of features including a range of engines from a 4-cylinder turbo (which at this point we don’t know if the Camro is oging to offer), to a next-gen V-6, a twin-turbo V-6 (in two tuning forms, neither of which are apparent for the Camaro but both of which could be offered plug-in with only chassis tuning needed), the LT1 6.2l V-8, and the supercharged version of that engine now offered in the CTS-V (a sure thing for the Camaro). Transmissions range from 6-speed manuals to 8-speed automatics. Differentials range from conventional limited slips to electronically controlled limited slips. And then there is the magnetoreological dampers, which we understand will be offered in at least the pedestrian “SS” model and certainly in future ZL-1 and possibly Z/28 type offerings. Because this is a shared platform, nearly all the engineering is sharable from the much more expensive Cadillac cousins. Compare and contrast to the Mustang. The engine lineup starts with a 2.3 EcoBoost, which makes less HP than the Camaro V-6 but much more torque. This is going to be an interesting comparison. Ford doesn’t pay any attention to its own V-6, which like the Camaro is all all-aluminum DOHC design with independently variable cam timing on the intake and exhaust. But in the Mustang it isn’t strategic and is simply an entry point (in the Camaro, judging from the sound of the prototype in the video above, it is strategic and is tuned to appeal). We then move to the V-8s, where the Mustang offers a nearly state-of-the-art 5.0l DOHC V-8, with port injection (instead of the much more desirable direct injection) as the entry-level GT engine (which makes less HP and torque than the Camaro’s LT1), and a hyper-exclusive >500 HP 5.2l liter engine for the GT350. We point this out because only 137 GT350s will be built for the 2015 model year, and rumor has it that production will also be limited for 2016 (just try getting one – and the markup in both years will be absurd). What engine GM will offer to compete with the GT350 is yet to be seen, but the 640 HP supercharged 6.2 from the CTS-V is a certainty and perhaps just 1 of 2. These are interesting times we live in. Ford has had the advantage with a new product for the past year, and now GM is countering with its own new – and more modern – product.